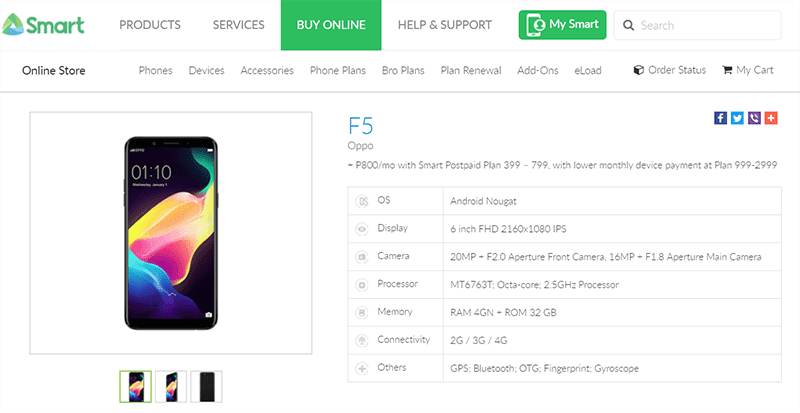 Previously, we reported that the OPPO F5 is will be available at Smart's Postpaid Plan 599. Today, we got an info, that OPPO and Smart made the deal even sweeter! Interested Smart subscribers who wants to own the OPPO F5 may avail the said handset starting at Plan 399 with 800 monthly amortization. In total, users only need to pay PHP 1,199 per month. However, the freebies won't be that big as Plan 599 anymore. Plan 399 includes 3GB monthly data, Unli All-Net texts, 20 mins All-Net calls, 500MB for FB Messenger, Viber, and WhatsApp, and Discounted calls to Smart/TNT (P4 per min) for 24 months. But still, this would be great for those who wants to own the OPPO F5 selfie-centric smartphone for as low as PHP 1,199 per month. To know more about OPPO F5, you may check our review by clicking this link.